If your Whiskey Creek, FL building’s pipes were installed sometime between the 1970s and the 1990s, then it is possible that you might need to have them replaced. During that time, it was common to use polybutylene pipes because they were both easy and inexpensive to install. However, over time, it became clear that this material was not suitable for plumbing. If you do have this kind of pipe in your building, here are several reasons to have it replaced. Even if polybutylene worked perfectly well in plumbing systems, plastic pipes don’t last as long as metal pipes and generally need to be replaced more often. If your pipes were installed around 50 years ago, they might be reaching the end of their lifespan and may start causing problems. One reason that this material is no longer used for plumbing is that it does not react well to chemicals commonly used for treating water. Anti-bacterial products and chlorine can cause the material to become brittle and more easily damaged. If the pipes break or crack, you will end up having to deal with water damage. Another reason to consider installing new plumbing pipes is that this material can affect the quality of your water. As the pipes break down, chemicals can begin leaching into the water. You certainly don’t want to drink contaminated water or serve it to employees or guests. Because polybutylene piping has proven to be unsuitable for plumbing systems, you cannot have it repaired. Building codes in the United States will no longer recognize this kind of pipe and they will always need to be replaced. For these reasons, if you have this kind of pipe in your plumbing system, you should have it replaced as soon as possible. If you experience damage to your building as a result of a broken or damaged pipe, a water damage remediation company can clean and restore the property. When mold is present in your business in Tice, FL, it’s likely that you will be eager to begin the remediation process as soon as possible. However, the amount of time required for mold removal depends on several factors. The area affected by mold growth will affect how much time it will take to restore the building. If mold has not spread throughout the building and is contained to one area, removal can take as little as three days. However, if mold is present in drywall, on ceilings and in air ducts, it will likely take longer for mold remediation specialists to bring down the number of mold spores to an appropriate level. The type of mold that is present in a building can also affect mold removal. Whereas less harmful types of mold may be significantly easier to remove, removing black mold can be an extensive process. In order to remove this type of mold, professionals will need to use specialized equipment and also will likely need to take additional precautions to ensure that they remain safe throughout remediation. In some situations, there may be several types of growth in a business, which may require specialists to use a variety of removal techniques. Mold often occurs after an area has been affected by water damage. Whether water damage is caused by flooding, a pipe leak or a broken appliance, it’s important for all aspects of the building to be inspected to ensure the business will be safe to reopen. If a building has been damaged structurally, mold remediation can take a week or more to complete. The mold removal process can vary greatly from property to property. 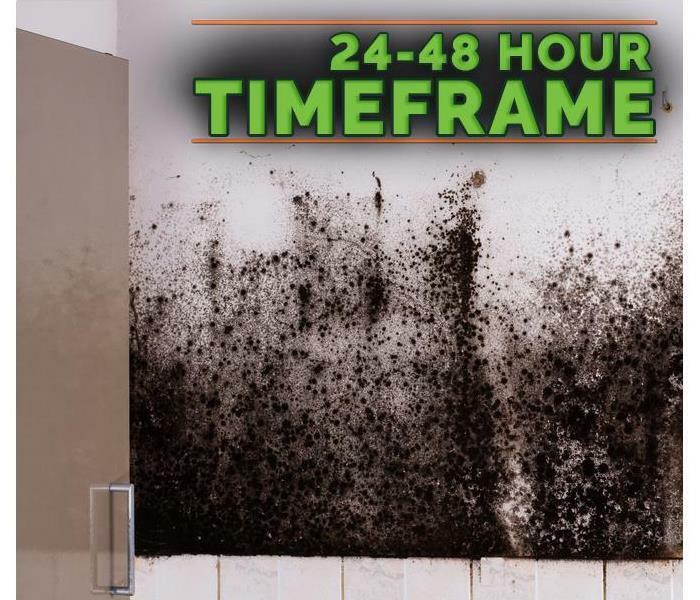 The amount of time it takes for mold to be removed from a business will vary depending on the size of the area that’s affected by mold, the type of mold and whether or not there is any additional damage. Unexpected storms can leave devastating Storm Damage in Central Fort Myers, FL. It happens every year. Somewhere in America, a hurricane strikes, leaving flood damage, wind damage, hail damage, and roof damage in its wake. Flooding and river flooding are par for the course. They can happen anywhere when nature shows its wrath. Ice damming, ice damage, and frozen pipes are typical during winter storms. If storm damage hits close to home, it can leave you bereft and crushed by the burden of your need for water restoration or home restoration. Before you toss your hands in the air in surrender, contact your storm damage restoration professionals. You can have successful storm remediation. Your professionals have the equipment to handle the job. No problem is too big. They'll break out the flood pump, get rid of that ice dam, patch up your roof leak for a serious roof repair job, and repair frozen pipes. Whatever storm damage has come your way, your professional storm damage restoration crew is on the case. No matter what has happened to affect your home, your professionals will handle storm remediation. If your home has been hit by flooding or river flooding, you are going to have flood water or ground water in your home. It could stop at the basement or make it to the first floor. Your flood pump may not be enough to clear out the water. It may be necessary for ain industrial brand flood pump to remove all traces of ground water or flood water. A flood pump will get rid of the remains of flooding or river flooding. It can also handle the flooding caused by frozen pipes. Water restoration services will include removing ground water or flood water. Water restoration also includes a complete drying of all surfaces, including the floor, walls, and furniture. Furniture that has been damaged beyond repair, along with other belongings, will be removed. Anything that can be salvaged will be cleaned and sanitized. The flooring will be sanitized. Any flooring that needs to be repaired will be replaced as part of your water restoration services. Roof damage is another issue after hurricane damage, wind damage, ice damage, or hail damage. Ice damming can be a serious problem as well and result in an ice dam. This can lead to a roof leak that will require roof repair. Your roof leak could be small or it could be a major issue. Your professional damage restoration team will assess all ice damming concerns and remove the ice dam if you have ice damage on your roof that is causing a roof leak. If you have a roof leak or other roof damage caused by wind damage, hail damage, or hurricane damage, you can trust your home restoration team to resolve the problem. Storm restoration services will take care of any type of roof damage, whether it has been brought on by hurricane damage in the warmer months or an ice dam during the winter. Trust that your roof repair will give you a solid, leak-free roof once again as part of your comprehensive plan for storm remediation. When you have storm restoration services from professionals, you can have the peace of mind that comes with knowing everything will be completed. Flood water and ground water will soon be a memory. Roof repair will ensure no more damage takes place. Your home restoration will finally allow you to enjoy your home sweet home after storm remediation. If you have any questions, please give us a call at (239) 334-8700. SERVPRO of Central Fort Myers has the training and experience to respond inmediately to restore your home and avoid further damage. Will Using Drain Cleaner Ruin Your Pipes? Harsh drain cleaners have the potential to cause severe damage to your plumbing system. When you have a clogged drain, your initial instinct might be to reach for a chemical cleaner to get your pipes back in working order. But not all drain cleaners are created equal, and using one that’s too powerful for your residential plumbing system can result in catastrophic damage. That’s why it’s important to be cautious in how you resolve a drainage issue and to use a technique that’s appropriate for your piping network. By keeping some basic guidelines in mind, you can ensure your home in Fort Myers, FL, stays clog-free without resorting to unnecessary harsh chemical treatments. 1. Check the material and condition of your pipes. A harsh chemical cleaner should never be used on aging metal or plastic pipes. That’s because these relatively weak materials won’t be able to withstand the powerful caustic compounds used to break up clogs, which can result in warping or holes in your plumbing system that requires expensive repairs. 2. Consider alternative clog removal methods. 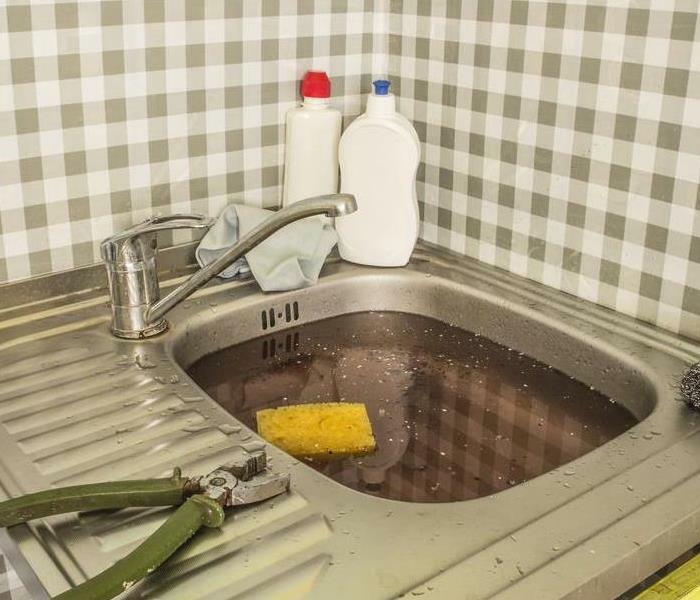 In many situations, it’s possible to correct a clogged drain without resorting to chemical cleaning agents. A simple plunger can be very effective in removing small to medium sized clogs. If that doesn’t work, there’s a wide market of natural, non-toxic drain cleaners available that utilize the biology of enzymes and bacteria to gently eat away at the clog. 3. Know when to call in a professional. If you do decide to use a chemical cleaner to remove a clog, have the contact information for a sewage cleaning service on hand in case your plumbing system sustains damage. Pipes that have been corroded due to caustic cleaning agents can cause water leakage, so you’ll need the knowledge and experience of an established residential restoration contractor to assess and correct any flood issues. A clogged drain can be a major inconvenience, and you may be tempted to use a chemical cleaning agent as a quick fix to dissolve the blockage. But harsh drain cleaners have the potential to cause severe damage to your plumbing system, so it’s best to proceed with caution and consider alternative clog removal methods. When a disaster strikes one of your clients in Buckingham, FL, as their insurance agent it is often your responsibility to select a reputable restoration and mitigation company for them to call. That is one of the reasons you probably keep a preferred vendor list that gives you easy access to trustworthy companies and their contact information. SERVPRO can be found on most of those lists for three reasons. Well known and successful companies generally have a long list of positive jobs they have completed, as well as satisfied clients in their long business history. With their specialized certification, you know the technicians can perform their duties to the highest of cleaning, mitigation, and restoration industry standards. 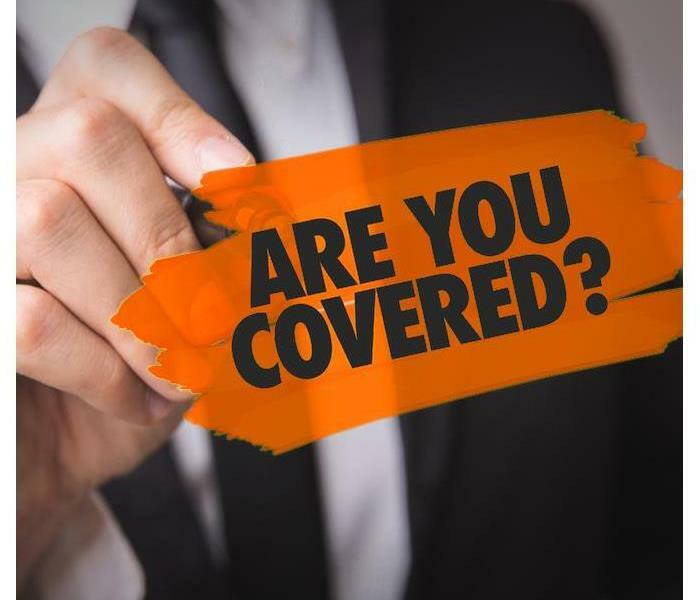 Insurance personnel can rely on the consistently high standard of work performance by those technicians, and that is why they can be found on the preferred vendor lists. SERVPRO has a computer tracking program called the CIC. The Claims Information Center focuses on keeping the client, insurance agent, adjuster, and contractors linked through online data that can be renewed quickly to make sure all parties are constantly up to date. Along with job details, the spreadsheet includes work estimates, employed personnel, and job expenditures. Choosing a certified technician from the vendor program allows you to rely on those individuals you have a successful work history with. With each technician upholding industry certification standards, it also allows you to know that those individuals are the best the industry has to offer. To qualify for the vendor program, each specialist must meet the requirements set in a 21-point guideline to ensure you have the most reliable workforce available. You work hard to keep your clients happy, so it makes sense you would use a preferred vendor list to choose the most qualified technicians around. Selecting a trained and certified specialist can help make you a happy insurance agent when the claim is quickly handled by knowledgeable technicians. Mold can damage the contents and structure of a residence in Fort Myers, FL. It is almost impossible for homeowners to determine the extent of a mold problem on their own. A mold specialist or environmental hygienist should conduct testing to inform an expert mold assessment by remediation professionals. Air samples are the most common and may be taken indoors and outdoors. Bulk samples involve testing contents or materials. Surface samples check for the presence of mold spores on interior surfaces. A mold assessment will vary depending on whether the issue is minor mildew growth or a major infestation of a toxigenic species such as black mold. A cleanup service may recommend the use of containment equipment for severe mold problems. All of these factors affect a remediation estimate. The extent of damage will determine the cost of mold removal. A remediation service will consider the amount and species of mold and whether structural damage has occurred. Testing may cost several hundred dollars, and the price of remediation may range from several thousand dollars for a minor infestation to tens of thousands of dollars for a major mold problem. Each of these stages is crucial for an accurate mold assessment. Homeowners should rely on experts to determine the degree and type of mold growth at a residence in Fort Myers, FL. This information can contribute to a more successful remediation effort. SERVPRO is a certified company. When your client needs restoration to his or her Fort Myers, FL home, you want to make sure that he or she is getting the best possible help. Using a company that is certified by the Institute of Inspection Cleaning and Restoration Certification means that you can feel confident that the job will be done well. Here are a few reasons why a company certified by the IICRC is the best choice. When a company is certified by the IICRC, they must follow their standards. The Institute of Inspection Cleaning and Restoration Certification is a member of the American National Standards Institute which determines the guidelines for many business sectors. When you use a company with their certification, you know that they will have high quality standards for their work. Because SERVPRO is a certified company, they must be sure that all employees are trained to follow the correct procedures. Because of this, you know that you will only have competent and experienced workers restoring your client’s home. They will follow all required standards during the cleanup and restoration process. Companies that don’t follow a set procedure can sometimes leave you wondering what to expect during the restoration and repair process, but that is not the case with SERVPRO. Because they are certified by the IICRC, you can expect the same quality of work from them every time. When the job is finished, you can be sure that everything has been done well. When a client’s home is damaged, it can be a stressful experience for everyone involved. Working with a damage restoration company that has a restoration and mitigation certificate can give you peace of mind. You can rest assured that you are providing your client with the best help that he or she can get. Is Your Business Flood Ready? Flooding can cause extensive damage at a commercial property in Lehigh Acres,FL . Building owners and managers should take the following measures to limit the severity of damage. It is a good idea to make digital backups of records. Store paper files in a location that is not as likely to flood or on any level above the ground floor of a structure. Appliances, paper files, devices and furniture may remain in good condition if these items can be moved to a higher floor of a structure. It is also a good idea to try to raise electrical panels, switches or wiring in the basement or on the ground floor. Owners of buildings located in a flood zone should maintain flood insurance. 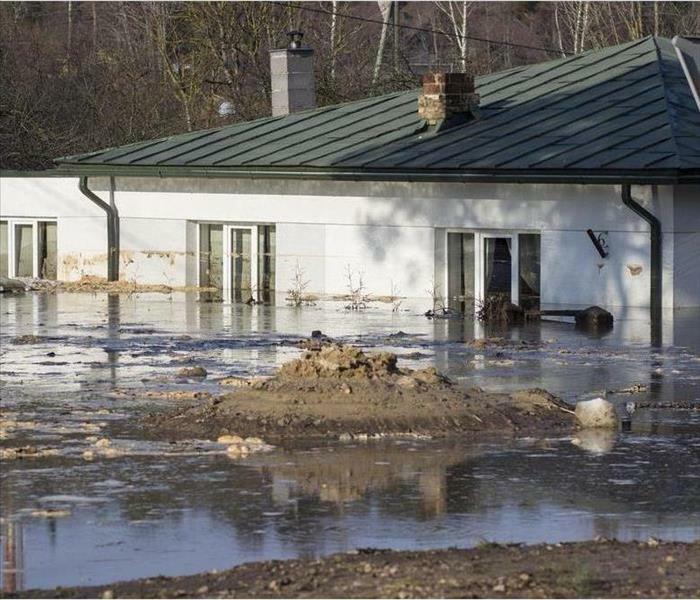 This coverage can offset the cost of flood damage mitigation and restoration. Make sure the policy is current, check the limits and keep track of contact information. Investing in a sandbag alternative can make preparing for flooding easier, faster and more affordable in the long run. Many of these systems can be reused. Building owners may want to have a basement waterproofed. Test the sump pump and install a battery-operated backup or generator in case of power failure. These measures can lessen the extent of flood damage at a commercial structure in Lehigh Acres,FL . If a building sustains damage from flooding, schedule a consultation with a mitigation and restoration company. 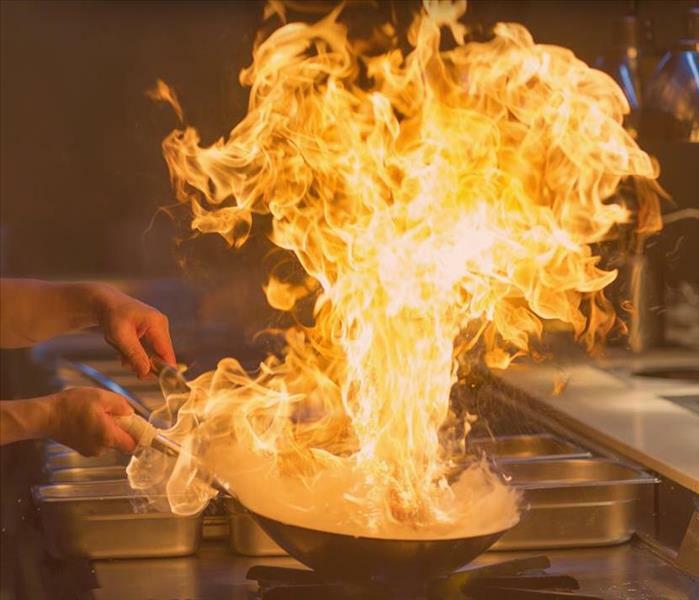 Fire departments respond to about 166,000 fires started by cooking equipment every year. These incidents endanger residents and result in over one billion dollars in fire damage. Reduce the risk of a cooking fire by keeping these four tips in mind. Even if a recipe takes a while to prepare, you should keep a close watch on food. If you need to leave the room, set a timer and make sure no combustible items are near the stove. Regularly check on food to prevent burning. Whether you have an electric cooktop with hot burners or a gas stove with open flames, it is important to keep ingredients and other items off the surface of the stove. Avoid storing oven mitts, napkins or towels above the range. This is one of the most important tips for preventing a cooking fire. Make sure any container you intend to microwave is approved for this use. Never heat foil or paper not intended for cooking in a microwave. If you are preparing packaged food, remove any materials that are not intended to be heated. 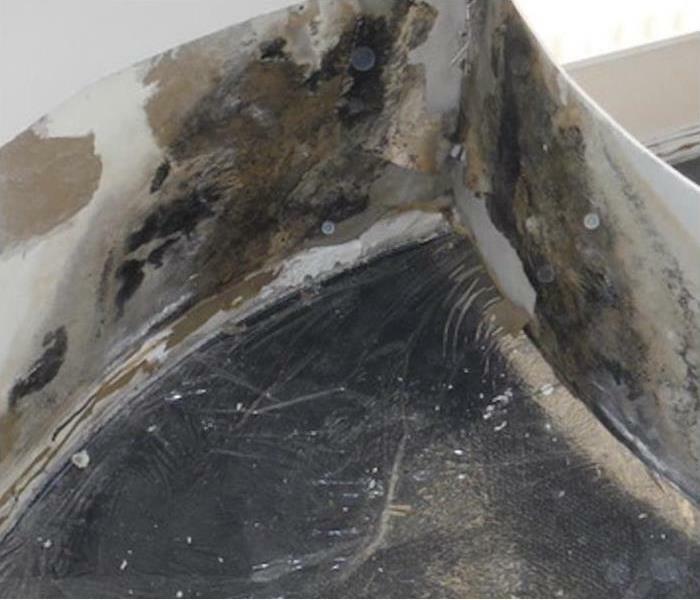 Grease and oil cause some of the hottest and most damaging kitchen fires. Slowly heat fats to a safe temperature before carefully adding food. Avoid introducing moisture to hot oil and never fry food that is still frozen. Fire extinguishers can cause a grease fire to spread. Safely smother flames by dousing with baking soda and salt or covering a pot or pan with a metal lid or cookie sheet. These tips can help home cooks prevent fires. Make sure your kitchen is equipped with a working smoke detector. 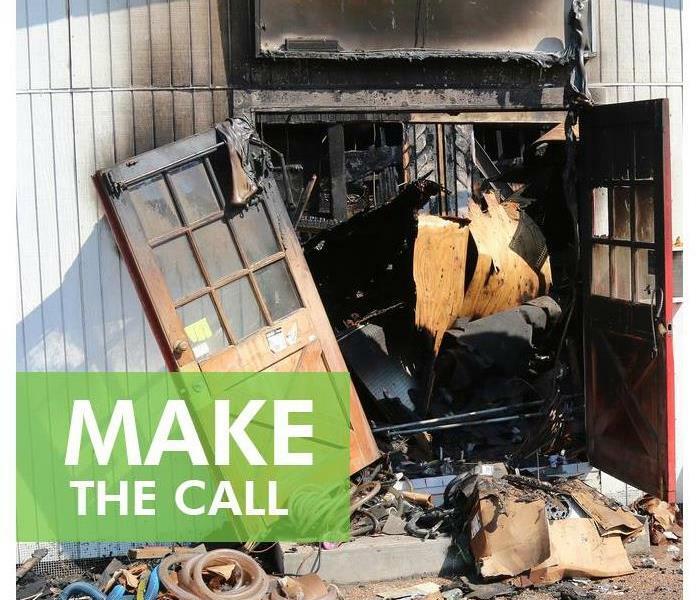 If a fire breaks out and damages a residence in Ft. Myers,FL, contact a mitigation and restoration service. Although the terms mold and mildew are often used interchangeably, there are some differences between the two. Unless you are a microbiologist, you probably can’t identify the exact variety of fungus you may have in your house in Fort Myers, FL , but you can still learn about the basic differences and why it matters to you to prevent mold damage. When you see a fungus growing in your home, you can ask yourself some questions to help you distinguish between mold and mildew. Mildew growth is white, but molds can be a variety of colors including black, red, green, or blue. Organisms in the fungus family are defined by having long filaments (hyphae), but mildew is less fuzzy than most molds. Does it seem to be deeply rooted or just on the surface? Mildew tends to be more superficial, while mold growth is usually deeper. Why does it matter if you have mildew or mold? Well, mildew is usually a lot easier to clean up. You can often use a solution of bleach or other disinfectant to scrub it off a surface. Mold is a bigger problem because spores are everywhere in the environment, and they only need a moist area and organic food source to survive and reproduce. Mold is also very difficult to control due to the deep root system and the fast reproduction cycle. It can easily turn into a mold damage problem. You need to act fast to get control of a mold problem in your home. Hiring a professional mold remediation company is the best way to get it done quickly and effectively. These experts have specialized equipment and take the necessary precautions, like the use of negative air chambers, to minimize the spread of mold spores while mitigating mold damage. 3/23/2019 - Will Using Drain Cleaner Ruin Your Pipes? 2/11/2019 - Is Your Business Flood Ready?